Light rain (συνολικά 7.0mm), mostly falling Τετάρτη απόγευμα. Freeze-thaw conditions (μέγ. 10°C Τρίτη βράδυ, ελάχ. -3°C Παρασκευή απόγευμα). Winds increasing (ασθενείς άνεμοι Β Τρίτη βράδυ, σχεδόν θυελλώδεις ΔΒΔ από Πέμπτη βράδυ). Mostly dry. Freeze-thaw conditions (μέγ. 9°C Δευτέρα απόγευμα, ελάχ. -2°C Παρασκευή βράδυ). Winds decreasing (ψυχροί άνεμοι ΝΔ Παρασκευή βράδυ, αίθριος από Δευτέρα απόγευμα). Ο παραπάνω πίνακας παρέχει τη πρόγνωση καιρού για Mount Hotham στο συγκεκριμένο υψόμετρο των 1850 m. Τα εξελιγμένα καιρικά μοντέλα που χρησιμοποιούμε, μας δίνουν τη δυνατότητα να παρέχουμε προγνώσεις χιονοπτώσεων για κορυφή, μέση και βάση του Mount Hotham. Οσο αφορά τις προγνώσεις καιρού σε άλλα υψόμετρα, χρησιμοποιήστε την καρτέλα πάνω από τον πίνακα. Για μια ευρύτερη άποψη του καιρού, ελέγξτε το Χάρτης Καιρού για Australia. If you love freeriding, Mount Hotham is one of the best ski resorts in the world. I should know as I have skied every major Australian and NZ ski resort, many resorts in western Canada, western USA, Italy, France, Austria and Switzerland. I normally visit around 25 different international ski resorts per year. If you are prepared you may encounter rain, slush, elephant snot, Australian Powder, Canadian corduroy and champagne powder. You will enjoy the good, the bad and the ugly at Mount Hotham. Like all Australian ski resorts conditions and weather are variable, but Mount Hotham has many secrets. Secrets so good, that when the conditions are perfect, there is not a better place to ski. Try the following during the worst possible snow storms only with a local or a Mount Hotham ski ambassador. 3. The Canyon and Brockhoff off the HV chair. 1. Gotcha, The ridge, and Mary's Slide. 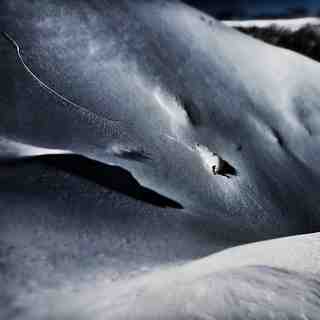 As soon as you drop off the ridge you are in a paradise full of untouched powder! 2. Coles Bowl and the remaining runs skier's left are great if the bottom funnel of Mary's has been skied out. 3. If the Orchard is closed, don't fear, ski all the way down Keogh's down to Orchard load cross the Swindler's platform and follow the creek back to Swindler's trail. It eventually joins the official Valley trail from Mary's Slide. 1. HV as it typically opens on certain in-peak season at 7:30am. Check with Guest Services. It is good everywhere. 2. Wendix is untracked, because most people turn right at the top of HV. 3. Try skier's left of Imagine, over the ridge is untracked, then continue to top of Brockoff and feed right back onto Patroller's drop. 1. Ski the Extreme zone. 3. After Orchard is done ski Boarder's Valley, skier's right of Spargo's trail. Snowboarder's take this option, because they run out of momentum as Spargo's trail enters the flat, wooded section of the run. 4. One tree hill is quite nice. If this is what you like then, ask Guest Services or a local to show you the Golden Point area. Do not enter this area without local knowledge. There are no reference points through the woods and you could easily lose your bearing. The area is skied out very quickly, so, be sure you can ski any run in any condition. 1. Australia drift and Avalanche Gully. 2. 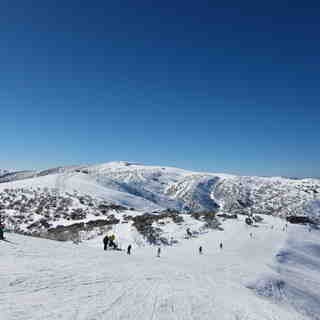 If you like this alot, Dargo west face and try Parachute Drop (Instructor's Gully) way beyond the Drift T-bar. 3. Done it all...ski HG AKA Harris Gully, but, you should have backcountry experience before skiing down the other side ridge beyond the Drift T-bar. 4. There are more bowls including Dargo bowl, and Diamantina or South West face to Baldy Hollow beyond the Telecom tower on the summit. 3. Women's Downhill off the south face of Mt. Higginbotham. As you can see, there is plenty to offer the freerider!